Avocado oil is versatile and delicious. With a high smoke point of 250°C, it is ideal for cooking, baking, drizzling, dipping, frying and roasting – even for braaiing. It is an excellent substitute for other culinary oils and is suitable for vegetarians and vegans. Pull the husks back from the corn and tie with kitchen string. Braai until tender and golden, about 10 – 12 minutes. Combine the butter-flavoured avocado oil, lime rind and salt, and brush over the cooked corn. Set aside. Slice the chicken breasts in half horizontally, brush with the butter-flavoured avocado oil and braai until cooked through, about 1 – 2 minutes on each side. Mix to combine the coriander, spring onions, chilli, plain avocado oil and lime juice. 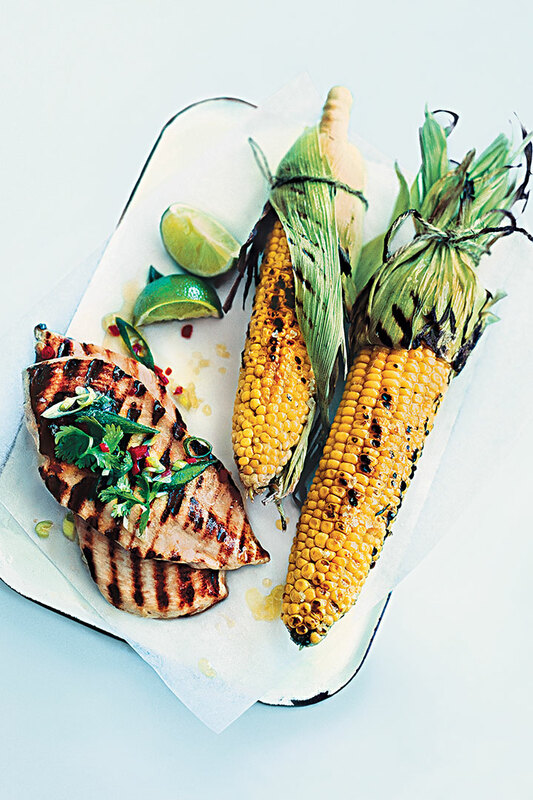 Top the chicken with the coriander mixture and serve with the corn cobs and lime wedges.